Good news, I can fix this! Have your branding essentials but need a bit more in-house or custom design help? I can do that too! 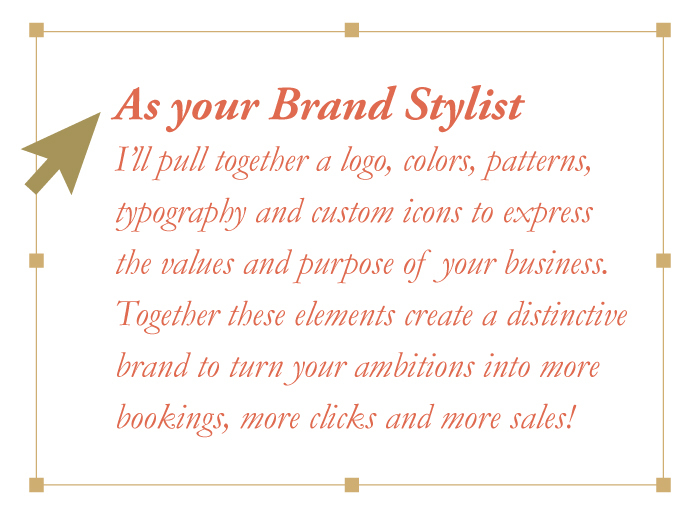 Working together, I will help you discover your brand’s style and ideal client. Think of this as the What Not to Wear of brand design, where we’ll get rid of the old, the tired, the not-you graphics and give you a fresh, innovative, head-turning look! Let’s build a brand that is not only unique but also intentional, fitting your purpose and leading to action! Do you have your branding essentials and need some extra “accessories” for your business? Think of me as your personal (and virtual) in-house designer to create professional marketing materials, social media graphics, e-newsletters, course materials and more! I’ll come alongside you in your business to help it grow while saving you time to be more productive on your business.